Author and historian Adam Selzer has spent over a decade running hundreds of tours per year for companies such as Chicago Hauntings, Shoreline Sightseeing, and Weird Chicago. Early in his career, he began fact-checking the stories commonly told on such tours and found that they were a mess! With painstaking research, he rebuilt the stories he was telling from the ground up, spending hours poring through reels of microfilm, piles of paper from the legal archives, and drawers full of long-forgotten photos and documents. This gave him material to make his tour different from any others. With years of practice, his tours are the most entertaining in town, often showcasing the humor that he used in his acclaimed novels for Random House and Simon and Schuster, including Just Kill Me, Play Me Backwards, and the cult favorite I Kissed a Zombie and I Liked It. He is the author of several books, such as Ghosts of Chicago (Llewelyn 2013), Flickering Empire: How Chicago Invented the US Film Industry (University of Columbia Press 2015), The Smart Aleck’s Guide to American History (Random House 2015), Ghosts of Lincoln (Llewelyn 2015), and, of course the Mysterious Chicago book, released in 2016 by Sky Horse, who also published his mammoth HH HOLMES: THE TRUE HISTORY OF THE WHITE CITY DEVIL. 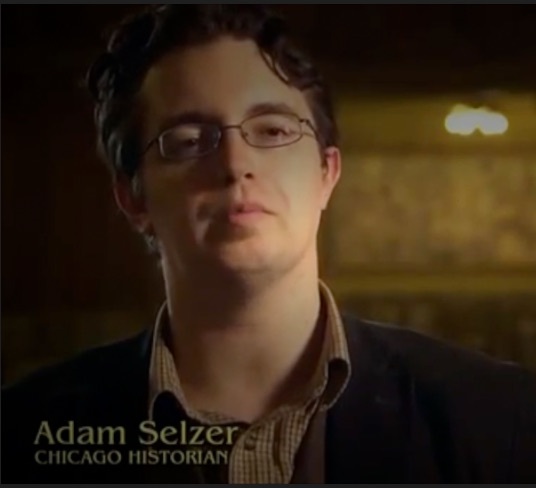 He regularly appears on TV shows, including American Ripper (four episodes), Mysteries at the Museum (five episodes), Haunted History, Monumental Mysteries, Hotel Secrets and Legends, Dark Places, and more.